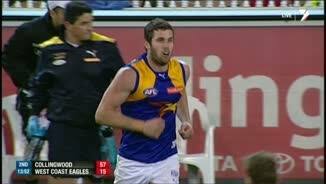 Eagles InterchangePatrick McGinnity off due to the blood rule. Eagles InterchangeBrad Sheppard off due to an injury. Eagles InterchangeSharrod Wellingham off due to an injury. The Pies work the ball inside 50 & Cloke goes one on one with MacKenzie in the goal square & Cloke gives away the free for holding. GOAL PIESSwan runs inside 50, he doesn't have possession of the ball but he taps the ball to his advantage & takes possession, he hurriedly has a shot from 40 & drills it! BEHIND PIESO'Brien with quick hands out to Reid, he attempts the snaps from around his body but his kick misses to the near side. Kennedy with the long kick to half forward in a bid to send the Eagles inside 50 however the kick is cut off by Shaw across half back. The Pies lead by 29 points & they are moving the ball far too quickly for the Eagles at the moment. West Coast are struggling to get to the ball first. GOAL PIESSidebottom with the short kick inside 50 & Lynch takes the mark on the lead, he lines up 50 out on a 45 degree angle & he splits the middle perfectly! GOAL EAGLESLycett takes the strong overhead grab as he outmuscles Seedsman, he lines up 25 out pretty much straight in front & gets a much needed goal for the Eagles. BEHIND PIESCollingwood quickly work the ball out of defence & O'Brien has it just outside 50, he unloads & the ball is bouncing goal-ward but it is offline & through for a behind. BEHIND EAGLESIt's a long kick to the top of the goal square but no one can complete the grab & it is rushed through for a behind. GOAL PIESSidebottom takes the grab 20 out on the boundary, he spots Thomas unmanned & he centers the ball to him, Thomas lines up 20 out & threads through the Pies' 5th! 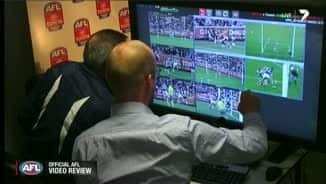 GOAL PIESThe score review is complete & a goal has been awarded to Reid, the Pies lead by 23 points! GOAL REVIEWReid in the goal square on full stretch attempts the soccer off the ground, it goes through but was it touched by Brown before it crossed the line? 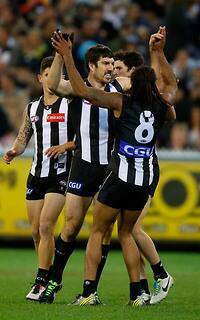 The Pies are off to a flying start & lead by 17 points in the very early stages. GOAL PIESReid receives a free down field for being held, he lines up just 30 out on a slight angle & makes no mistake of it. GOAL PIESSeedsman on the run & he unloads from 55 out, it's a bouncing ball in the goal square, which way will it go... It bounces on the right side of the goal post & through for a goal. Darling with the inside 50 however the kick goes straight to Keefe & the Pies are away. GOAL PIESThe quick handball comes out to Lynch, he has a hurried right foot snap & against his former team splits the middle! BEHIND EAGLESKennedy takes the grab deep in the forward pocket, he plays on to improve the angle but his kick misses to the near side. 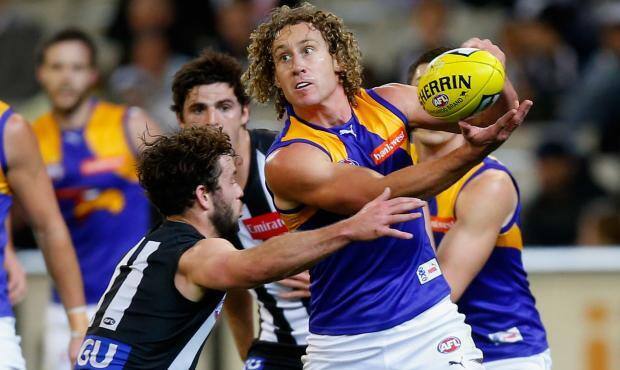 The siren sounds, the umpire goes BANG & Priddis receives the free for holding the ball. Welcome to the MCG where the in form Collingwood host West Coast. Collingwood have been forced to make a late change with Beams being replaced by Seedsman. Welcome to MCG for the Collingwood v West Coast Eagles Round 22 clash. COLLINGWOOD has enjoyed a timely confidence boost on the eve of the finals, dominating a flat West Coast to win by 62 points at the MCG on Friday night. After being humbled by Hawthorn seven days earlier, the Magpies bounced back in a powerful performance that re-established them as a September threat. 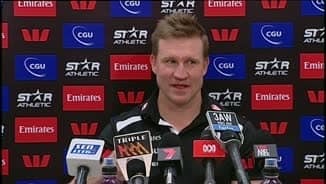 In an even performance that will leave coach Nathan Buckley with welcome selection headaches, Collingwood ran out 15.11 (101) to 5.9 (39) winners to improve its record to 14-7 for the season. The severity of West Coast's fall, however, is sure to be a major talking point after its lowest-ever score at the MCG, which came a week after its lowest score at Patersons Stadium. Incredibly, it was less than 12 months ago these two clubs played off at the MCG for a place in a preliminary final. 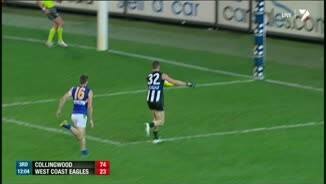 The Eagles' inability to be competitive meant the contest fizzled by quarter time, with Collingwood 37 points clear and in no danger of surrendering that lead with its season still alive. Brownlow medallist Dane Swan was best on ground, winning 34 possessions and kicking two goals, tearing through a lethargic Eagles midfield with his running power. The only concern for the Magpies was a possible injury to midfielder Luke Ball, who was substituted in the opening minutes of the third quarter with calf tightness. Otherwise, it was a night for the Magpies' faithful to enjoy, with the club's young players superb as they fought for positions in the team going into finals. After being substituted into the match for Ball, Alan Didak also earned loud applause every time he won the football in his third appearance this season. Every Magpie on the ground ran to him when he kicked a goal halfway through the final term. Young midfielder Josh Thomas starred in the first half with 22 possessions and a goal, and he kicked on to finish with 35 disposals. Paul Seedsman was a late inclusion, replacing midfielder Dayne Beams (back tightness), and he took his chance, winning 30 possessions and kicking a good running goal from long range. Key forward Travis Cloke took the lead in the Coleman Medal race, kicking three goals to take his season tally to 61. Ben Reid remained forward and kicked four goals, while Scott Pendlebury (37 possessions), Marley Williams (27) and ruckman Brody Grundy (11 and 23 hit-outs) were impressive. Scott Selwood (33 disposals) battled hard for the Eagles, as did Matt Priddis (32 and nine tackles) in his 150th game. They lacked support, however, on a dark night for the Eagles. Rubbing salt into the wound, young forward Jack Darling was substituted out of the clash early in the third quarter with hamstring tightness. Collingwood produced its best first quarter for the year and its best start ever against West Coast, racing to 8.3 (51) at the first break, with the Eagles held to just two goals. From that point there was a sense of inevitability about the result. "The first quarter is as good as footy we've played," Buckley said after the match. "[Our] contested ball, [we] defended really well, put pressure around the ball, and were able to take it inside 50 and be really damaging. "That's as good as we've played in in all three phases." While they held their own at the coalface early, the Eagles couldn’t contain the run of their desperate opponents, who had options and space whenever they won the football. By half time the Magpies had won 29 more uncontested possessions than West Coast, taken 19 more uncontested marks and laid eight more tackles. Out-of-contract coach John Worsfold said he knew what the Eagles needed to do to improve, but conceded the season had undoubtedly been disappointing after West Coast had been tipped by many as a flag favourite. "This club's always measured success on premierships, but also on performing up to expectations," Worsfold said, admitting the meek end to the season had challenged his self-belief. "This year we've been under expectations, and that's been really disappointing. "Whether it's a wasted opportunity or not, I'm not sure." There is a changing of the guard underway at West Coast as premiership heroes retire and others near the end of their decorated careers. The question that arose on Friday night was who, other than Selwood, is ready to drive the Eagles' response from a horror year in 2014.